In high school, the father of one of my friends was a potter, and his lifestyle inspired me. I chose a college that had a good academic reputation but also an excellent clay facility—Albion College in Michigan. 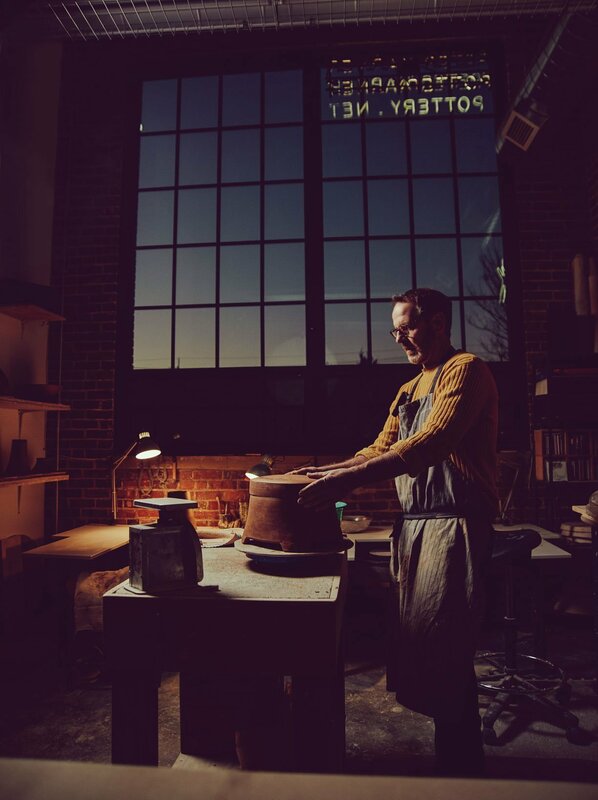 I was fortunate to have a professor who placed me in a pottery apprenticeship after my first year, and again after my senior year. I had lots of opportunities to build kilns and experiment, so I had a strong foundation. From there I chose to go my own way. I moved to Durango in 1989, and in ’95 I built my own studio and set about creating a full-time life around pottery. I was able to sell what I made right away, while experimenting and growing my work. I moved to Denver in December of 2013 and opened my studio in the Dry Ice Factory in RiNo. The driving force of my work is the desire to make pots that are ancient and modern at the same time. When I go to the Denver Art Museum, I love the second level of the North Building—the Native American floor. It has some amazing baskets and pots that have really contemporary designs but are actually ancient. I love that. I’m attempting to do that in my own right, which requires a lot of experimenting. I’m not a conceptual artist who draws everything out and then pursues. I’m more of a trial-and-error artist who has an idea and sees it through to fruition, finding out what does and doesn’t work and slowly coming to understand the form and pattern and how they integrate. Even though I’m inspired by ancient forms—bells and boxes and ceremonial vases—I want my forms to be as contemporary as possible. My glazes, on the other hand, can reflect more of an ancient patina look. I use a gas kiln, which gives a very different glaze than an electric kiln. But even though the glazes insinuate age, I don’t want my pots to look old. I consider myself a modernist. That creates a kind of tension. I want people to ask, “Is this something dug out of a tomb, or made last week in RiNo?” That’s what I’m interested in—that tension for the eye. I’m trying to keep the viewer curious. I have galleries all over the country, so people can see my work in many places, and online. My gallery representation is stronger on the East Coast than out West. I have no gallery affiliation in Denver, though I’ll be exhibiting at the Cherry Creek Arts Festival this summer. But I really encourage people to come to my studio in RiNo if they’re interested in purchasing work. All my contact information is on my website, and I’m happy to meet anyone by appointment.